Plants densely cespitose. Rhizomes short, internodes 0.2-1(-8.5) mm. Culms 1-1.6 mm wide. Widest leaf blades 2.8-4.4 mm wide. Longest inflorescences 24-44(-53) mm. Perigynium beak 0.36-0.48 times as long as perigynium. 2n = 60, 62. Fruiting spring. 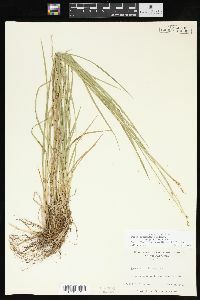 Mountain streamsides, seeps in deciduous forests, rarely mountain bogs; (400-)800-1400 m; N.C., S.C., Va. Carex bromoides subsp. montana is endemic to the southeastern portion of the Blue Ridge Physiographic Province.